Since our inception two years ago, the Netwealth portfolios have enjoyed strong performance. May 31st marked the second anniversary of the launch of the seven sterling-based portfolios. In both years, the performance of each of these portfolios has been ahead of wealth management peers. This solid performance reflects Netwealth’s experienced team and robust investment framework focused on diversification and efficiency, in addition to the benefits of low fees. Our aim is to continue to provide both an excellent service and to build on this solid performance. In response to client requests, we have also launched seven portfolios denominated in both euros and dollars, providing diversified investments for clients wishing to invest in these currencies. Below we provide details on the two year performance of the sterling portfolios. Source: Netwealth, from 31st May 2016 to 31st May 2018. Returns are shown net of all charges associated with the underlying fund investments, and an all-in Netwealth fee of 0.35% which covers management, trading, custody and administration charges. Netwealth’s fees range from 0.65% – 0.35% pa depending on account size. 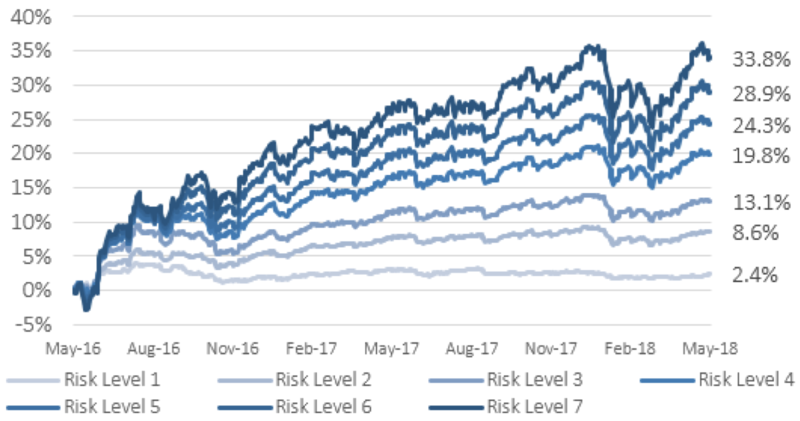 Thanks to efficient diversification, the risk-adjusted portfolio returns have outstripped market indices, as seen in Chart 2. Source: Netwealth, Bloomberg, from 31st May 2016 to 31st May 2018. For the peer group, we look at the Asset Risk Consultants (“ARC”) Private Client Index performance numbers. Netwealth portfolio performance has been above the relevant peer group in each risk category since inception, as shown by Chart 3. Source: Netwealth, Asset Risk Consultants (“ARC”), from 31st May 2016 to 31st May 2018. Includes estimated performance for the ARC Private Client Indices in April and May 2018. 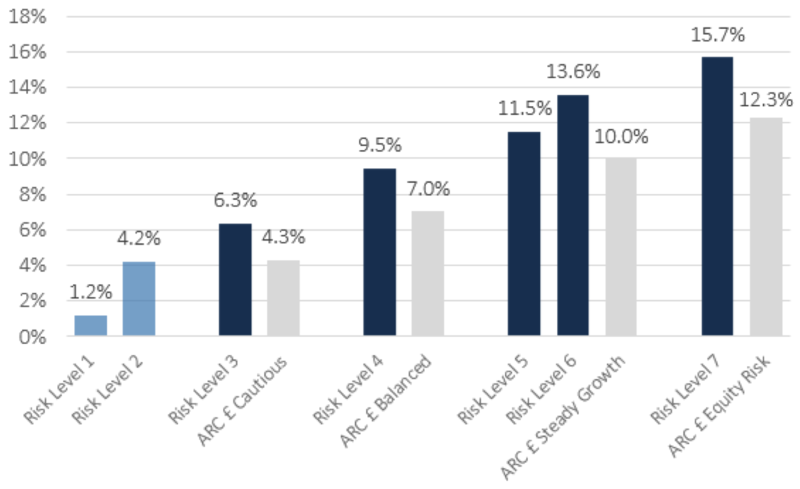 Due to their more conservative mix of assets, Risk Levels 1 and 2 are not comparable with ARC Private Client Indices. The difference between Netwealth and the peer group’s returns after fees ranges between 1.5% and 3.6% per annum since launch. We believe that outperformance in the first year was driven by a combination of factors, including strategic decisions linked to the economic and financial outlook as well as assessing market expectations and risks ahead of some potentially key event risks, such as the UK Referendum and US Presidential elections and important policy decisions. Traditional wealth managers often claim that employing actively managed funds gives them an advantage, especially in a downturn; however, the evidence indicates this is not necessarily the case. It’s also likely that some managers were tempted to de-risk clients’ portfolios at inopportune times during the volatile periods in the first quarter of the year, thereby missing out on subsequent gains. Source: Netwealth, Asset Risk Consultants (“ARC”), from 31st May 2017 to 31st May 2018. Includes estimated performance for the ARC Private Client Indices in April and May 2018. 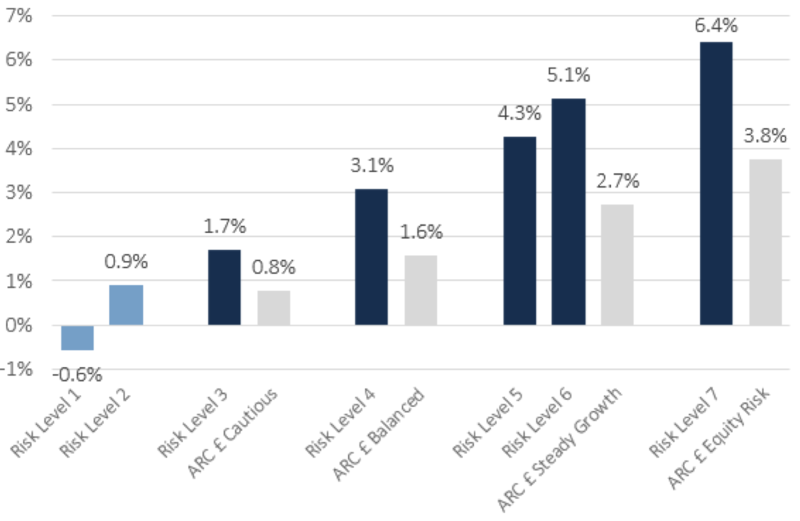 Due to their more conservative mix of assets, Risk Levels 1 and 2 are not comparable with ARC Private Client Indices. A principal theme underlying Netwealth’s outperformance is the lower level of attritional costs on portfolio returns. We continue to emphasise the lasting damage that compounding high costs can do to long-term returns, and our past two years’ returns underscore this point. A key aspect of our service is using cutting edge technology both to enhance the offering with improved transparency and accessibility and by keeping fees to an absolute minimum. We estimate that this approach has contributed around 1.2% per annum to our clients’ net of fee portfolio returns. This time last year many analysts were discussing the likelihood of a global reflationary cycle and describing former safe haven bond markets as sources of risk rather than return. The consensus now appears to have shifted to concerns over growth. Some of the market’s fears have come to pass, such as the (partial) de-rating of the tech sector, geopolitical risk focusing on emerging markets, the growing unease about Europe’s economic stability and the lurking uncertainty over Brexit. These concerns have heightened volatility, or as some would put it, have hastened a return to more normal levels of market variability. Other fears have faded more recently, such as over increased protectionism and aggressive policy tightening leading to bear markets in bonds. This may have acted as a brake for a potentially more severe market downturn and helped to allay broader economic anxiety. Meanwhile, the unknowns remain unknowable. We can recall the wisdom of Black Swan author Nassim Nicholas Taleb and assume that black swans will continue to take flight. And while we can never predict such events, we can prepare for when they appear. Our approach has been consistent throughout the first two years and we intend to continue in the same vein. Netwealth’s strategic allocations remain the bedrock of our portfolio management approach. By sticking to sensible, calculated combinations of diversified, liquid assets our investors are protected from many of the behavioural pitfalls that can meaningfully impact long-term investment performance targets. We believe the benefits of this strategy have been reflected in our performance. Coupled with a rigorous adherence to lower costs and our focus on compounding incremental gains for portfolio returns, we consider our portfolios to be well positioned to help clients continue to achieve their investment goals. 1 Many liquid versions of alternative investments such as infrastructure assets, commercial real estate vehicles, gold, catastrophe bond funds, ‘CTA’-style hedge funds did little to protect portfolios in volatile periods this year.